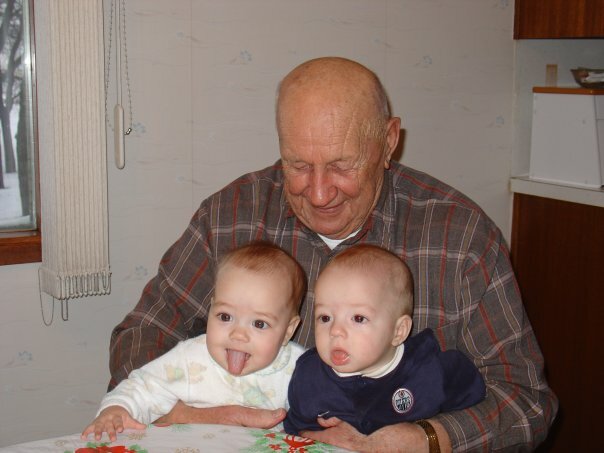 Grandpa holding Vivian and William. One hundred years ago today, one of my favourite men was born: Walter William Rasmussen. My grandpa is the namesake of my son, William Walter; the patriarch of all things witty; and my connection to Norwegian heritage and baseball. At his funeral nearly seven years ago, one of my cousins recalled how Grandpa was the first person in the community in the 1980s to install a satellite dish (about the size of a small house). He did this so that he could watch NASA and follow space exploration. I can’t help but think how big of a fan he would have been of Canadian astronaut Chris Hadfield. A few months after Grandpa died, I wrote a piece that was published in the Globe and Mail‘s Lives Lived column. It is my pleasure to share it with you today so that you might know a tiny bit more about the man who taught me to laugh and to love. Father, grandfather, farmer, community builder, baseball player. Born August 18, 1914, near Dacotah, Man. Died April 10, 2008, in Winnipeg of pneumonia and prostate cancer, aged 93. Walter Rasmussen was an innovative farmer who knew the value of building community and cherishing his ever-growing family. The youngest of 10 children, at 8 he became one of the “men of the house” when his father died. By the time he was 20, his mother had passed away. Perhaps this knowledge of loss led Walter to cleave so strongly to his descendants. Because of the demands of farm life, Walter’s formal education ended when he was 12. But his appetite for learning never diminished. Over his lifetime, he progressed from farming with horses to using GPS-driven computerized equipment. In 2003, the farm that was started by his Norwegian parents, Jacob and Sofia, was designated a Centennial Farm by the Manitoba Historical Society. Walter said he thought it was much harder to be a farmer now. “In the old days,” he said, “you could only work as long as the horses could. You couldn’t put in 16-hour days. I think the horses were smarter than us.” After the horses were stabled, he and other men from the community would gather to play ball until darkness fell. Walter’s ability as a catcher was legendary: from a crouched position, he could throw out a runner at second base nine times out of 10. Although he loved farming, Walter valued family and community even more. He and his beloved wife, Ruth, had four children – Ronnie, Janice, David and Darlene – 10 grandchildren and 23 great-grandchildren. Like his father, he served as a council member for the Rural Municipality of Cartier. Shortly after Ruth died in 2001, Walter once again baked cookies, this time for her caregivers at the extended-care facility that would eventually become his final home. Walter’s death did not parallel his dignified life. In retrospect, however, perhaps he hung on to give his family an opportunity to say goodbye and to realize that there are fates worse than death. I remember your grandpa very well with his quiet sense of humour and that twinkle in his eye. He would always ask me how my fastball was going and I know that he was genuinely interested. He truly was a gem of a man. When my son was working on the Bethlehem Garden project for his heritage fair project Walter was one of the very few of the original homesteaders in Dacotah he could interview. Your grandfather was so happy to answer questions, be interviewed, and provide photos. A truly kind man! Your grandpa sounds like one amazing man! Sounds like he made quite an impact on your life! What a great guy….. you cannot compare that generation with anything else. They were tough and they were survivors. My Dad passsed away in March of this year at the age of 92. He, too, lost his wife to Alzheimers and ended up in extended care. I so identify with your family. “The horses were smarter….” Cracks me up! What a beautiful tribute to your Grampa. That was a beautiful tribute to your grandfather and made me miss both of mine even more. Thank you for sharing!